Here are the results of the speaker feedback "bucket votes." Attendee comments will be sent to speakers soon. Thanks to everyone who voted. Email us with any questions about the votes. We had a great time, and hope you did too! Please let us know what you thought (both the good and the not-so-good) by taking our survey (the link opens a new page at Survey Monkey). We especially appreciate having your individual comments. You can also send email to provide feedback. Please join us for EclipseCon Europe 2011, November 2–4, in Ludwigsburg, Germany. It's our premier European event re-imagined, with a new name, more space, and expanded content. 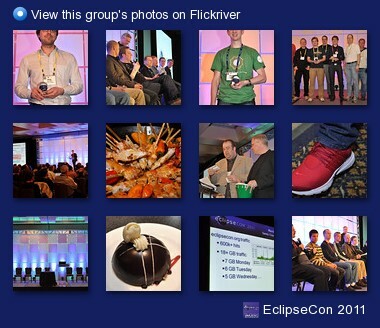 Join the Flickr group and upload your photos. They'll show up here! Chris Frost, QR-CodeBreakers Game grand prize winner. Chris won an Xbox Kinect, courtesy of Microsoft. Rong Chen, QR-CodeBreakers Game grand prize runner up. Rong won a Droid Pro, courtesy of Motorola. Ivan Kornienko, Gunnar Wagenknecht, Borislav Kapukaranov, Sergey Prigogin, David Cummings, Jorge Mario Calvo, and Mike Slavin won Amazon gift certificates and Motorola phones for participating in the Speaker Feedback bucket voting.